Ferguson’s Rock at Beckley, W.Va.
Ferguson’s Rock is an inscribed stone of mysterious origin located at Wildwood in Beckley, West Virginia, in central Raleigh County. The stone was formerly located along the banks of the Piney Creek near where an early trail forded the stream. The stone is locally significant as an artifact of pioneer history that predates the region’s early development in the 1830s. One local legend proposed that a hunter by the name of Ferguson, from Franklin County, Va., was fatally injured after being thrown from his horse near the ford. In a wilderness far from help, he chiseled the inscription as he awaited his death. Several historians have speculated that the inscription might have been chiseled by a member of the Ferguson family, noted fur-traders of Franklin County, and that the characters were inscribed for amusement while its author passed time. During expansion of a city sanitation plant in 1984, the stone was removed from the margin of Piney Creek and relocated to the property of local historian Ray Sutphin on Bero Avenue in Beckley. 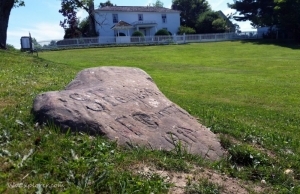 In 2017, the Raleigh County Historical Society requested that the property owners, James Bays and Amy Kirk, donate Ferguson’s Rock to the city, after which it was installed on the lawn at Wildwood, the historic homes of Alfred Beckley, founder of Beckleyville, later the City of Beckley.